← How can mindfulness be implemented in education? As I have mentioned in former blogs, creativity is crucial to education but unfortunately often left out. It is important for social survival and person´s wellbeing. Creativity is a constructive act which often is characterized by lingering in the moment. The diligence in which an artist creates his artwork is defined by intrinsic motivation that comes from oneself. Creativity is closely related to mindfulness, because e.g. there too it is the moment that is essential. Wilhelm von Humboldt (1792) stated in his educational theory that the humanistic educational ideal is the equal education of all strengths, referring to teaching not only language and math, but also the arts. His principle can also be transferred to the brain. This would imply that not only a part of the brain should be trained but the whole brain. I opine that our current education system puts mainly the emphasis on training the left hemisphere which is associated with cognitive processing. In order to train both hemispheres schools should try to implement creativity which is in its turn again improved by mindfulness. 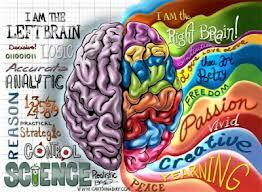 At first I will take a look at the neurological processes underlying creativity and mindfulness. Takeuchi et al. (2010) examined associations between creativity and white matter structures across the brain. Diffusion tensor imaging showed significant relationships between creativity and white matter in or adjacent to the bilateral prefrontal cortices, the corpus callosum, the bilateral basal ganglia, the bilateral temporo-parietal junction and the right inferior parietal lobe as measured by a divergent thinking test. These regions are spread out throughout the brain and both hemispheres are involved connected by the corpus callosum. This divergent neural activity is congruent with the concept of creativity which states that information is integrated and diverse high-level cognitive functions are at work. Carlsson et al. (2000) confirmed that highly creative participants used bilateral prefrontal regions compared to low creative persons utilizing only the left hemisphere. Chávez-Eakle et al. (2007) compared highly creative individuals (artists, scientists) and a control group measuring the brain cerebral blood flow while performing a verbal task from the Torrance Tests of Creative Thinking. Results indicated greater CBF activity both in the right and the left hemisphere showing that creativity is associated with bilateral cerebral contribution. Correlations of activity in certain brain areas with functionality suggest that creativity integrates perceptual, volitional, cognitive and emotional processes representing a holistic activation of brain areas. Conversely, many different scientists take the stance that functional brain asymmetry is one main contributor to initiate an affective disorder (Davidson, 1992; Flor-Henry, 1983; Heller, 1993). An over-activation of the right hemisphere mediates negative affect (Schwartz et al., 1975) and therefore characterizes major depression (Debener et al., 2000), dysthymia (Henriques and Davidson, 1990) and depressed mood in general (e.g. Hagemann et al., 1999). Whereas damage of the left hemisphere can lead to depressive mood, lesions on the right hemisphere can contribute to euphoric reactions or indifference (e.g. Finset, 1988). These findings suggest that a balanced activation of brain areas contributes to health. Focusing only on cognitive tasks that come along with left-hemisphere activity can have further negative implications. Devinsky (2000) recalls that several studies suggest that the right hemisphere is highly important for a sense of physical and emotional self. Lesion studies show that the right hemisphere is central for physical self-awareness and the person´s relation to the environment and affective state. All these findings underline the importance that both hemispheres should be trained. Furthermore educational institutes have a great impact on childrens´ development because of a greater neural plasticity. Structural and functional connectivity decreases with age. The so-called functional dedifferentiation indicates a general reduction in the distinctiveness of neural representations when older, and this goes hand in hand with a reduction of efficiency of processing at the neural level (Madden et. Al, 2009; Park et al., 2010; Goh et al., 2010). How does mindfulness play a role in all this? Several studies demonstrate that meditational practice enhances creativity (Orme-Johnson and Granieri, 1977; Orme-Johnson et al., 1977; Ball, 1980) although others found only weak associations (Cowger, 1974; Domino, 1977). Colzato et al. (2012) investigated the impact of focused-attention (FA) and open-monitoring (OM) meditation on creativity. In FA meditation one is focused on a particular object whereas in OM meditation any sensation or thought is to be observed. Mindfulness integrates both aspects. Beginners start usually with focusing on the breath (FA) but later on you observe changes in yourself (OM). These meditational practices are then observed in terms of their effect on divergent thinking which means to generate new ideas (Guilford, 1967), and on convergent thinking, to generate one possible solution to a problem. Results show that OM meditation improves divergent thinking and FA meditation does not sustain convergent thinking. I outlined why creativity needs to play a bigger part in education and that mindfulness can enhance creativity. An often addressed problem though is that creativity can only take place when someone is confident. In his TED talk David Kelley says that our society has to regain creative confidence and proposes that everybody is innovative but there exists a widely spread fear of negative judgment. Brown picks up this idea in another TED talk and claims that we are embarrassed for showing our ideas and the fear that is induced causes us to be conservative in our thinking. Same applies to the education system. The current system has worked out more or less well and trapped in our own security thinking we do not want to take action. Tim Brown also says that children at first are much more creative and do not care what other people think about them, but with getting older and internalizing the fears of society they lose their former freedom of play. This implicates that creative confidence has to be built up at first and most crucially in school promoting creative and improvisational teaching styles with more impact of arts on the curriculum. Confidence is achieved by practicing mindfulness and enhancing a co-operative and friendly atmosphere in the classroom. Mindfulness and creativity bring about change, lead to better achievements in school and contribute to more confidence. This entry was posted in Uncategorized and tagged Brain training, Creativity, David Kelley, Education, Mindfulness. Bookmark the permalink. I agree with you that there is a great need to implement creativity teaching or ways to release it in schools. Evidence from a study in which creativity was investigated in schools in the States with students from K-6 showed an increased creativity among children with high implementation of a test that challenged creative thinking and through drawing (TCT-DP) (Maker, Jo, & Muammar, 2008). Reintroducing creativity back to the classroom by implementing an extra art session has also revealed evidence of enhanced positive emotions among primary school children, among social benefits and more creativity (Wood & O’Shannessy, 2002). Integrating arts as means to a non-judgmental aspect of expressing oneself could be achieved by hosting creative expression workshops. Findings, in which such workshops were offered to immigrants and refugees, showed that those were beneficial to the participants having a positive effect on children’s self-esteem (Rousseau et al., 2005). Building up self-esteem in students helps them gain more confidence, so why not use such workshops or art therapy more often in classrooms? What an interesting read, I especially enjoyed the research on the different effects from lesions in each hemisphere and I agree that health (both mental and physical) is closely related to balance. I argued in my first talk (see below) that music and sports should get more recognition in schools to tackle what seems to be a maths and science orientated curriculum. The TED talks you have embedded are spot on, fear of vulnerability and failures keep us from innovation – which is why we should reject the right/wrong philosophy of schools. 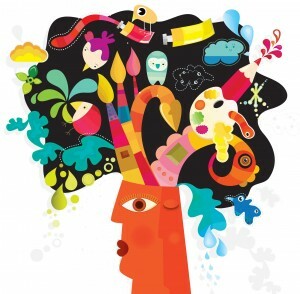 I wondered whether mood affective how creative we are; Chermahini and Hommel (2012) explored how mood affects creativity, similar to health, they found balance to be the key for creativity. Extremes of moods e.g. blissfully happy or deep depression hamper creativity, this relates to attention in the sense that we have to balance arousal to effectively deal with our environment and pay attention.